The American song might be: “I Left My Heart in San Francisco”, but for us here in France it’s more like we all left a little bit of ourselves in Paris. One of the big news items here is the pollution in Paris and we indeed were witness to that. Despite the haze even at night, we were all fascinated by the lights, sights, and sounds of Paris. Our amazing group of students just loved exploring this fabulous city. The Bateau Mouche, La Tour Eiffel, and our play in the Quartier Latin were our evening adventures, with lots of museum and “quartier” exploring during the day. This group of cherubs were so wonderful and cooperative that they earned lots of time for shopping. My only hope is that they spent some euros for gifts for their own families. Jyles discovered French pastries and always had a bag of something tasty in her room. Our four gorgeous young men on the trip just had to eat dinner at Mc Do our first evening in Paris. Olivia wasn’t feeling well most of this evening, but she felt better the next afternoon. The next day Jacob F. was also feeling a bit “iffy” because of something he had eaten, but after a great bowl of French vegetable soup, he felt great. Jill ate snails and many of the girls ate the famous French onion soup! We have been blessed with great weather this entire time. It’s the first time I ever remember being in Paris when it wasn’t raining! It’s now Monday and the forecast continues to be for warm weather. So far France has been amazing. We started working at our crèches (daycares) on Monday and at first I was very nervous because I worried my French wasn’t sufficient. However, the service has been extremely rewarding. When Jacob and I first arrived, the children started whispering in French: “the Americans are here!” and crowded around us. This was intimidating but I quickly caught on. They spoke very fast which is the most difficult thing I encountered. They also tend to slur their language and use common slang which we are not taught in class. But for the most part I understand them and thoroughly enjoy their company. I am excited for what next week will bring. Service was fun so far. The first day, I had to play with the kids and help them do some “bricolage” (building craft project). It was really funny watching the kids all call the teacher at the same time because they had no idea what to do. The second day, there was a carnival that we had to go to. I helped them put their costumes on them, and then we left. We walked to where all the school regrouped and watched some shows set up for the kids. It was wonderful. The moment we stepped off the plane in France, I was completely overcome with astonishment. I couldn’t believe we were finally here! We walked to the arrivals, and to my delight, our host families were waiting for us. My host Camille found me before I found her. So began my tentative French conversation with her and her father. They drove me to their house, and I marveled at the wide expanse of land that France had. It was so incredibly green. At her house I met her mom and she was so warm and welcoming. The whole family made me feel welcome. The next day, Camille, her mom, her aunt, and I went to Strasbourg, with her sister Caroline. She was very lovely! She studies several languages including English, so I was able to have a decent conversation with her in English as well as French. Strasbourg is one of the prettiest cities I have ever seen. It is very grand, historical, and stunning. There was a kind of elegant grandeur about the buildings and the streets. We visited the cathedral and climbed over 300 steps to the top. The view was breathtaking! On Sunday, we visited Camille’s grandparents. They were so sweet! We went to the park near their apartment and they showed me the seagulls. It was very leisurely and I loved it. Then, we ate together, and I got to listen to them speak to each other in French. I wasn’t able to understand a lot of what they were saying because they were speaking so fast but all in all, it was a fantastic first weekend. All is Well in Sunny Alsace! All is well in sunny Alsace. The weather is perfect, the food is great, new friends, basically, so far it’s all good! We have started our service at the local schools. We never knew that spending a whole day with 3 year-olds could be so tiring! Maybe what’s even more tiring is speaking and listening to French all day long! We are learning a lot, and enjoying it. In the coming entries we will give more personal experiences of the trip thus far. Here are some pictures from the schools. Here are some pictures from the city of Strasbourg! The weather is magnifique here! We have arrived in France! After a long flight to London, breakfast in the airport, and a short flight to Basel. We have arrived in France! Throughout both flights, students were practicing their French, asking how to say this or that in the language. Needless to say, they were nervous, but excited. They were so happy to meet their families. This weekend is a relaxed weekend with families, before they start their service project on Monday. On Saturday, most families took their George School visitor to day trips. Nancy and I were able to see four of them in Strasbourg. They all seemed very happy! Tomorrow, early in the morning, service starts in the different schools! We will keep you posted. The students and faculty who are participating in the France service trip departed campus yesterday afternoon! Check back for photos and news from their trip. It’s Spring Break–That Must Mean Service! Over the next few days spring service trips will be departing from George School. Students and faculty will be traveling together to France, Mississippi, Nicaragua, South Africa, and Washington DC. You can read updates from the trips right here on the blog and learn about the fun and important work our students are completing. Started in 1957, this relationship represents the longest running student exchange program between a US and a French high school. George School students work as teachers’ assistants in a variety of educational settings and live with local host families. A trip to Paris is one of the highlights. Students also join their host families for local sightseeing. 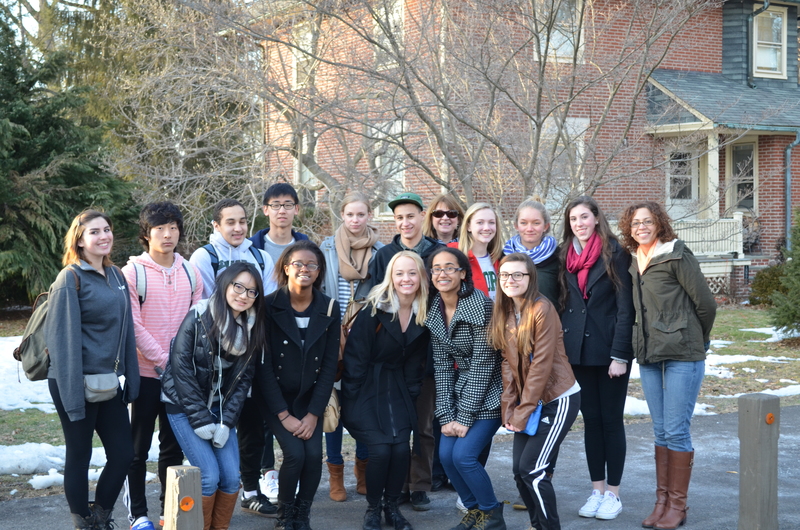 French students, in turn, visit George School several weeks later. Students work with Habitat for Humanity helping to build affordable houses along with those who lack adequate shelter in Northern Mississippi. The group also enjoys potluck dinners with current and future Habitat homeowners and other members of the community. Students build relationships with the community as they build homes. There also are opportunities to explore local sites of interest in northern Mississippi. schools and health clinics in impoverished areas. Students stay with host families who speak very little or no English. Cultural excursions typically involve visits to artisan markets, and historic sites, as well as the lakes and volcanoes for which Nicaragua is known. The South Africa service project immerses students in a cross cultural exchange with families from different communities in Capetown. Students will volunteer at an elementary and middle school during the day and assist at an orphanage in the afternoon. The orientation will include a review of the U.S. civil rights movement and conclude with an intense study of civil rights and apartheid in South Africa. Students will end their service by visiting the apartheid museum in Johannesburg. Students volunteer at Martha’s Table, SOME (So Others Might Eat), DC Central Kitchen, and a local mission. Using Hostelling International as home base, students will have the opportunity to visit museums and explore our nation’s capital.